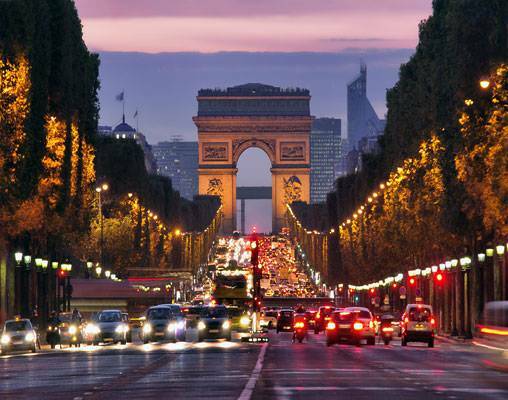 This exciting 16-day tour across Europe includes some of the continent’s most romantic cities. You’ll find yourself riding on one of London’s iconic double-decker buses, relaxing on a gondola ride along a Venetian canal, and tracing Michelangelo’s steps in Florence. Stroll along the banks of the Seine in Paris, and see past and present collide in Rome. Stand face-to-face with famous works of art like Leonardo da Vinci’s Mona Lisa and Michelangelo’s David. Throughout your journey, you’ll have the insider advice of a Local Host in each city, so you won’t miss a beat. 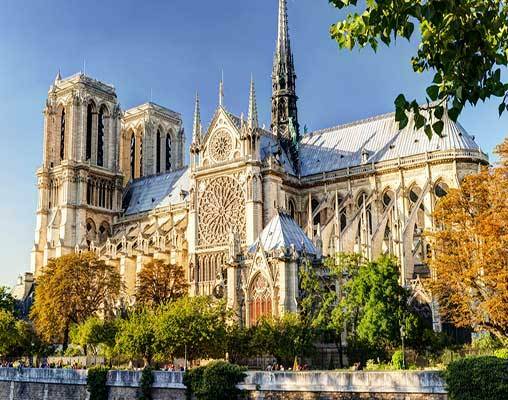 With transportation, hotel accommodation, and orientation tours expertly pre-arranged, this tour takes the worry out of travel, leaving you free to make the most out of your European vacation. Welcome to London! Your Local Hosts will help you maximize your stay in one of the most cosmopolitan cities in the world. Morning guided sightseeing includes all of London's famous landmarks. 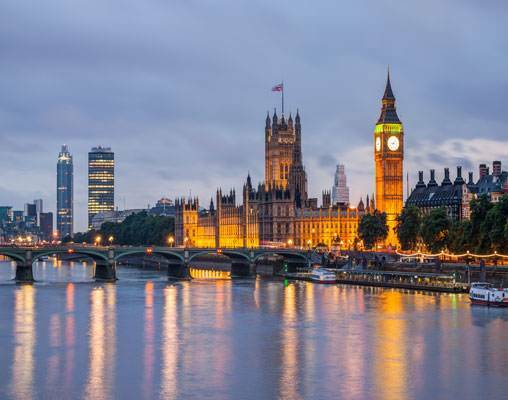 Drive past the Houses of Parliament and Big Ben; Westminster Abbey, where Prince William and Catherine, the Duke and Duchess of Cambridge, were married; Whitehall's mounted horseguards; the Prime Minister's Downing Street; and Piccadilly Circus, and Buckingham Palace. Take photographs of the London Eye, the giant Ferris wheel situated on the riverbank; the Shard, the tallest building in Western Europe. Visit St. Paul's Cathedral (except on Sundays). Sir Christopher Wren's masterpiece with its world-famous dome is an iconic feature of London's skyline, and the awe-inspiring interior holds fascinating stories about its history. Consider your Local Hosts' suggestions for your day at leisure. Maybe an afternoon at the 900-year-old Tower of London, still guarded by the famous Beefeaters, would be to your taste. Today, you may want to immerse yourself in France's famous cuisine—like its local cheese (over 400 varieties), onion soup, coq au vin (a classic chicken dish), pastries, crêpes, pain au chocolat, and much, much more! Your Local Host can help you organize your day. 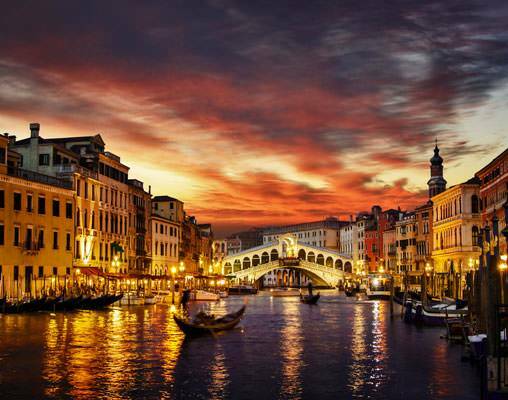 Travel by air to Venice on selected flights. Morning guided sightseeing with headset; see St. Mark's Square and Basilica with its exceptional gold mosaics. 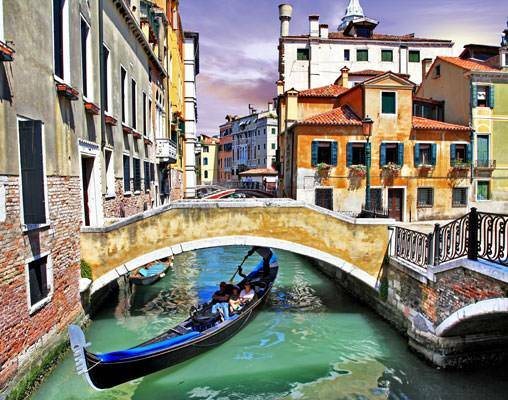 Visit Doges' Palace and the evocative Bridge of Sighs. Watch skilled glassblowers fashion their delicate objects in the age-old manner and learn why glassmaking was so important in Venetian history. Entrances to Marciana Library, and the Correr and Archaeological Museums are included; ask your Local Host for details. Your Local Host will have ideas for your day, such as the best places to shop for Murano glass items and Carnival masks. Travel by high-speed train (first-class) to Florence. Morning guided sightseeing, with headset, includes a visit of the Academy of Fine Arts featuring Michelangelo's original David. Walk through Cathedral Square; sculpture-studded Piazza della Signoria, the center of the city's political life since the 14th century; and Santa Croce Square. 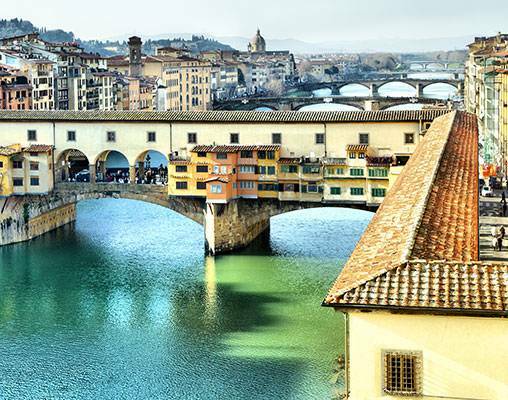 Also admire medieval Ponte Vecchio, the arched, stone merchant bridge spanning the Arno River. (Note that there are occasions when the Academy of Fine Arts is closed. On any of these dates, your full city sightseeing will be moved to an alternate day to ensure you have the full insider experience). Today your Local Host will have many options for your day at leisure. Travel by high-speed train (first-class) to Rome. Your morning guided sightseeing, with headset, is rich in religious and ancient history. 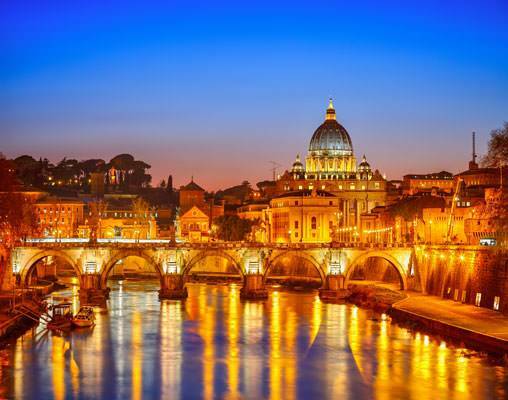 Visit the Vatican museums to see its amazing treasures. In the Sistine Chapel, where the Conclave is held to elect new Popes, view Michelangelo's The Last Judgment and his famous ceiling paintings. Also on the agenda today, see monumental St. Peter's Square and Basilica, built in 313 AD above St. Peter the Apostle's tomb and home to Michelangelo's masterpiece Renaissance sculpture, the Pietà. Cross the Tiber River and continue your immersion in history at the iconic Colosseum, built for 50,000 spectators, and the Roman Forum, where the oldest structures of the ancient city are located. (Note that there are rare occasions when the Vatican Museum is closed. On any of these dates, your full city sightseeing will be moved to an alternate day to ensure you have the full insider experience). Follow the ancient Roman advice Carpe diem (seize the day) and ask your Local Host for suggestions. You may want to ensure your return to the “Eternal City” by throwing a coin into Trevi Fountain. This charming 50-room hotel offers a real Venetian experience in the heart of the city and is housed in a former monastery dating back to 1879 with Free Wi-Fi access available in all guestrooms and public areas of the hotel. A breakfast buffet is served in the bright, airy breakfast room and can also be enjoyed in the serene courtyard garden during the summer months; the original chapel has been restored as a stately wood-paneled lounge/bar complete with the original oak pulpit. NOTE: This 3-story property does not have an elevator and may not be suitable for guests who are mobility impaired). 24th April 2019 $4,188 Please call for availability. 1st May 2019 $4,352 Please call for availability. Enter your details below if you would like to be notified when 2020 dates and prices are available for London, Paris, Venice, Florence & Rome. Hotel and Rail accommodations listed above, are subject to change based on availability at the time of booking. Tour prices are land only, per person based on double occupancy. Prices are correct at the time of publishing; however are subject to change. Additional departure dates are available, please speak to a rail specialist for details.